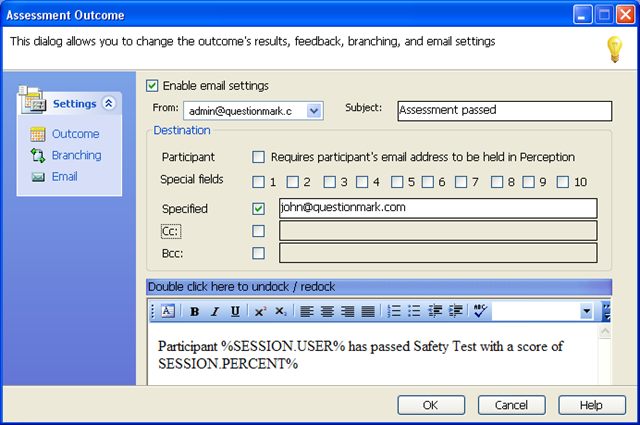 One of our customers — a training manager — recently requested we add to Questionmark Perception the ability to automatically send an email at the end of an assessment. He needs to know as soon as people pass certain assessments that have safety implications. I was pleased to be able to tell him that you can do this already in the software. And in case anyone else wants to do this and doesn’t realize it’s already possible, I thought I’d blog to let others know how to do this. 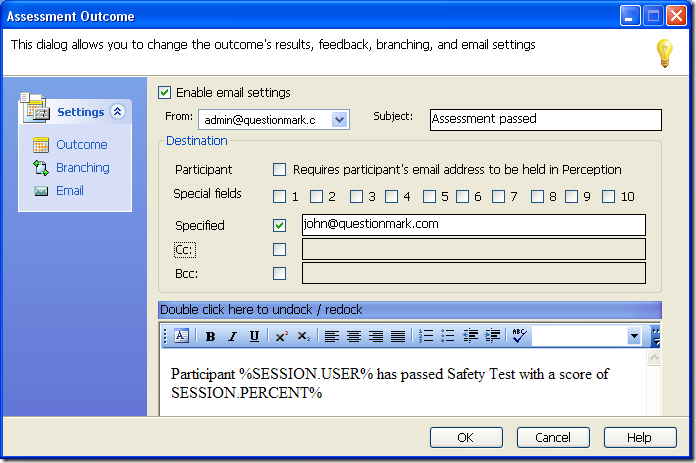 When you are creating an assessment in Authoring Manager, you can associate an automatic email with an assessment outcome, for instance to send an email when someone passes or fails. You can arrange for the email to go to the participant, to a specified email address or to an email address set in a special field. There are also easy drop-downs that allow you to include people’s name, score or details within the email. In the example above, I have set the email to be sent to me and to tell me the name of the participant and his or her pass score. Pushing out a notification by email at the end of an assessment will be useful to most Perception users, and I hope it’s helpful to be reminded how to do it. The suspense is over for those of you waiting for Part 2 of our tutorial on creating and editing assessments in Questionmark Perception! This video demonstrates how to customize and control how your assessment works. Find out how to use the assessment editor to arrange time limits, security options and other settings. Learn how to establish the look and feel of your assessment, create jump blocks, set up feedback options, organize post-assessment email messages and perform many other tasks. Click here to review Part 1 of the assessment creation tutorial, and here to watch our video about creating and managing questions.